Never worry about where to store your outdoor equipment pieces again! The Shelter Logic Shed Canopy is the perfect idea if you want an outdoor shed, or even just a place to organize some of your excess garage items. 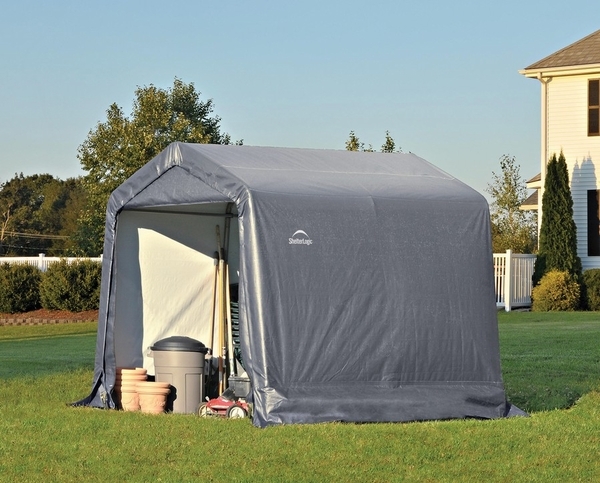 The steel frame will stand tall whatever weather comes, and the triple layer canopy is 100% waterproof and tear-proof. If you have been dreaming of the perfect outdoor storage unit, stop dreaming and pick up the Shelter Logic Shed Canopy today! Will this collapse under the weight of snow? This item is not snow load rated. 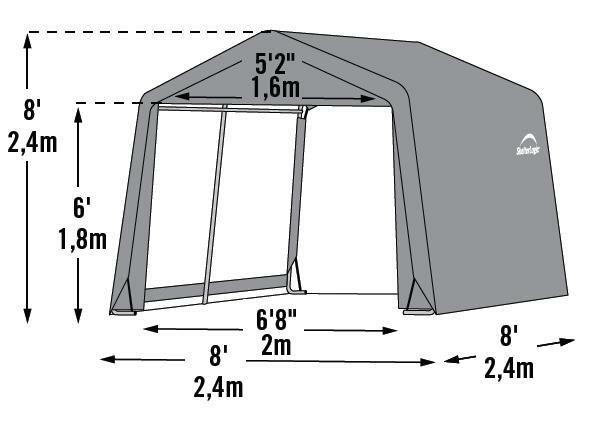 What is the door size of this ShelterLogic 8 x 8 Instant Storage Shed Canopy? The door is 6 feet tall and 6 feet 8 inches wide. What is the mil of this canopy's fabric? The fabric is 9 oz. polyethylene. Can this shed be entered on either end? No. This only has a door on the front. Does this 8 x 8 canopy have front and back flaps that come down? Yes, this model has a solid back panel and (1) double- zippered door panel for the opening. Perfect Fit for a Perfect Product! ProsVinyl Fabric is VERY durable. The tensioning system is just awesome! No problems whatsoever assembling Frame and the fabric fit like a glove and stiffened the whole thing up once together. Again, Highly Recommend this product. It arrive on time and everything was in the box with some extra hardware. After laying all the parts out on a table I had it all assemble in little over four hours. 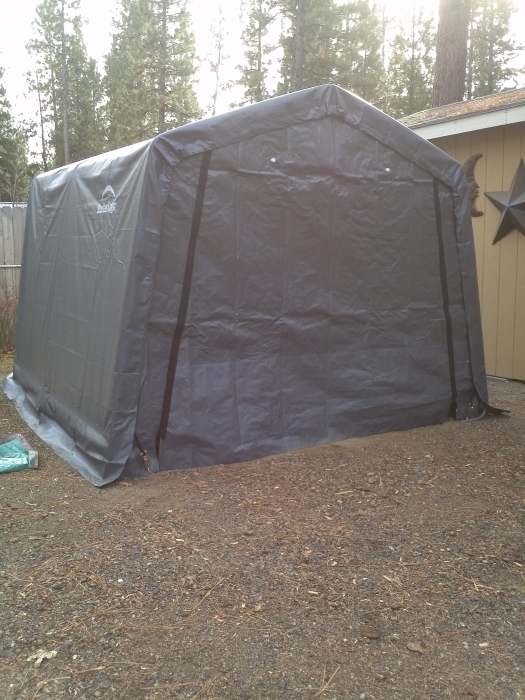 I had my wife help when I started to put the shelter up. All the holes line up and all the tubes went together with no problem. Not a big deal but you do have to read and study the instruction so you get the right parts for the shelter. This could be improve upon to make it easier to understand. But this will not keep me from buying another canopy from this store. ProsIt arrive on time and everything was in the box with some extra hardware. After laying all the parts out on a table I had it all assemble in little over four hours. I had my wife help when I started to put the shelter up. All the holes line up and all the tubes went together with no problem. ConsNot a big deal but you do have to read and study the instruction so you get the right parts for the shelter. This could be improve upon to make it easier to understand. But this will not keep me from buying another canopy from e-canopy. Everything from ordering to installation was easy as long as you followed directions step by step and don't cut any corners. It is a very sturdy shed. Keeps my hog dry. I've purchased this and the King Canopy 7 X 12. While the King Canopy was easier to setup, this tent appears to be much more stable in weather (large auger stakes included). Everything assembled easily following the instructions. For the price, a great deal. ProsLots of head-room inside. Secures to the ground better than King Canopy. 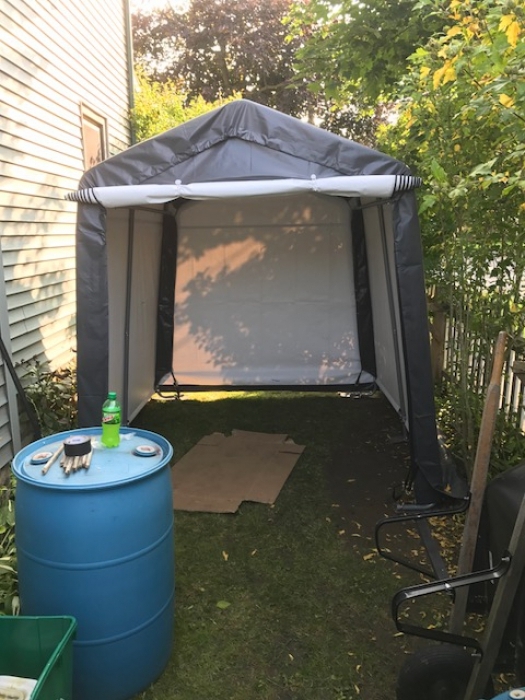 ConsLonger setup requires a second person compared to King Canopy. This website is easy to navigate. A price I can live with. Order process clean and easy. Shipping information sent daily. Package is complete every time (This is my 2nd Shelter). Setup is easy when you pay attention to detail (I put together by myself). I have had several wind events (50mph+) and this product performs! ConsBolts could be a little better defined. 3 different sizes that are only 1/8 of an inch difference. 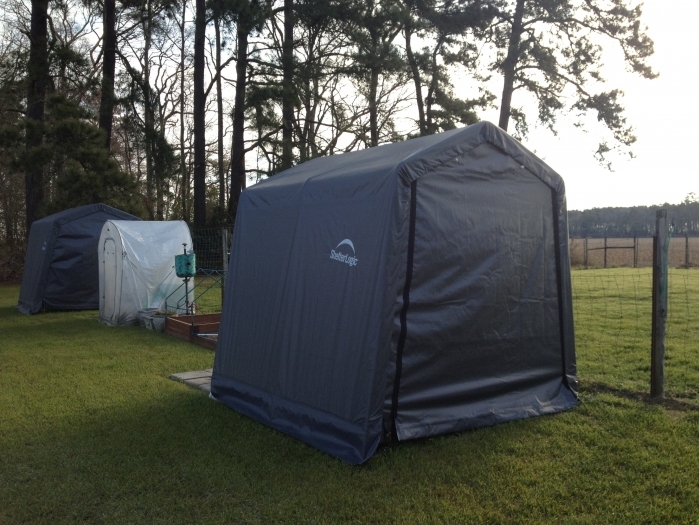 ProsPositive: - Inexpensive shed to cover items from rain, snow and sun. - Directions were easy to follow. - Lightweight made it easy to move. - Quick delivery. - Price was fair. ConsNegative: - There was one set of holes in one of the tubes that was incorrectly drilled, it was off by half an inch. No problem and not a show stopper, I drilled my own holes. - I thought the material would be thicker but what came will suffice. - When ratcheting down the straps for the front and back panels I had to run the straps around the poles because the glued portion of the panel isn't strong enough to hold. Once you put the straps over the horizontal side poles and under the bottom horizontal poles it was good to go. - I couldn't get mine as tight as the picture on the box...the front and rear panel are looser than the picture on the box because the material is bigger than the frame. Still works and I am satisfied. I bought 1 of the 8x8x8 sheds for my bikes and its great. I had a little trouble assembling it at first but I did it. I move around often and this shed is going to come in handy. Yes I would recommend this product to anyone. Assembly was easy and assembling in place is best. Had some trouble getting the canopy as tight as I thought it should be and I suspect some future cranks on the included fasteners will be required. All in all a pretty good quality shed that assembled easily. Placing the canopy did need 2 people. ProsTough material, included all hardware, simple instructions, parts well labeled. Went together with not too much fuss. The product arrived very promptly after ordering. As we started to lay out all the parts, everything seemed fine. However, once we got the frame up and started to put the back and front covers on it became apparent that we were not doing something right. They were both hanging rather loosely and no matter how many times we read the instructions, we just couldn't figure out how to tighten them up. The next day my husband finally came up with a fix and it actually lined up with the instructions. But, I know we both found the instructions rather vague. It's up now and we are very happy with the results. ProsIt looks exactly as advertised. Seems sturdy and we have both motorcycles stored in it. ConsThe instructions seem vague in places. The shed arrived within the time they said it would be delivered. It took my husband awhile to assemble but.....it was not as bad as he thought it would be. We only have had it up for 2 weeks but so far so good. Although unit'; cardboard container was nearly torn apart, content was intact and all the parts were available. It took about 5 hours to assemble the frame. The fabric has not been installed as I decided to use the supplied anchors in concrete as the unit will be in a permanent place. If unit is to be moved I suggest that the customer order the optional anchor kit. On a recent trip to Northeast Canada, I saw these shelters everywhere and it was perfect to store my riding lawn mower in Texas. it was a little tough to assemble, but boy was it worth every penny and more! i fit an entire darkroom and all the furniture from a 300 sq. ft. room in this tent while i'm lowering my basement floor.